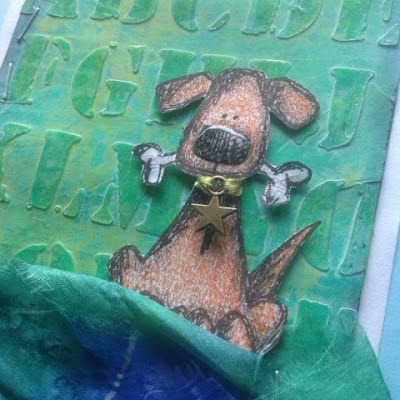 The Stampotique designers challenge is asking for cards for children. As lucky as one can be, a cousin is turning seven next week, and we are going to the birthday party, so I made a card for Jere. I wanted the card to be cute and have lots of touchy feely texture. 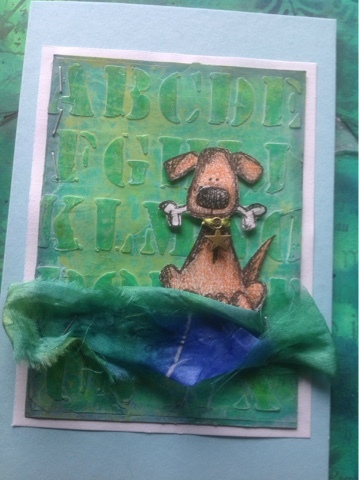 I started by colouring the ever so cute "give a dog a bone" dog and adding Crackle accents to the bone + Glossy accents to the nose. The doggy also got a metal charm round his neck. Jere has started school this autumn, so I chose to use an alphabet stencil for the background. I tore some silk for the ground and fastened it with staples to give a more masculine effect. Love your touchy, feely card. sooooo cute!